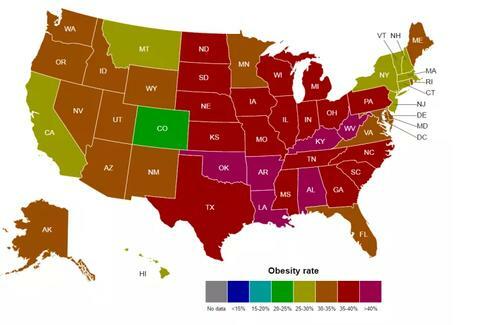 The United States is the most obese country on Earth. While the causes underlying the obesity epidemic are vast and complicated, it’s no secret that in America, fast-food is king. But how does this unfold across the country, and which states are the fattest? We surely have our preconceived notions about the topic, which are often beholden to stereotypes, but with the aid of maps compiled by DataVisualizations.net, the issue comes into focus. 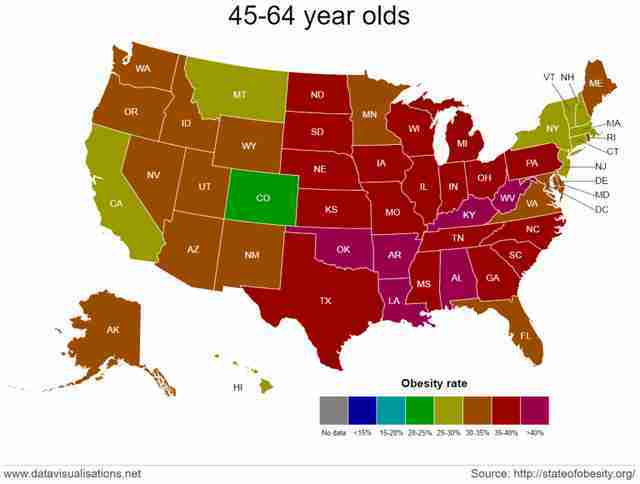 Using data from last year's The State of Obesity, an annual report assembled by the Robert Wood Johnson Foundation and Trust for America’s Health, the maps detail the average obesity rates of four age groups: 18 to 25-year-olds, 26 to 44-year-olds, 45 to 64 year-olds, and those 65 and older. 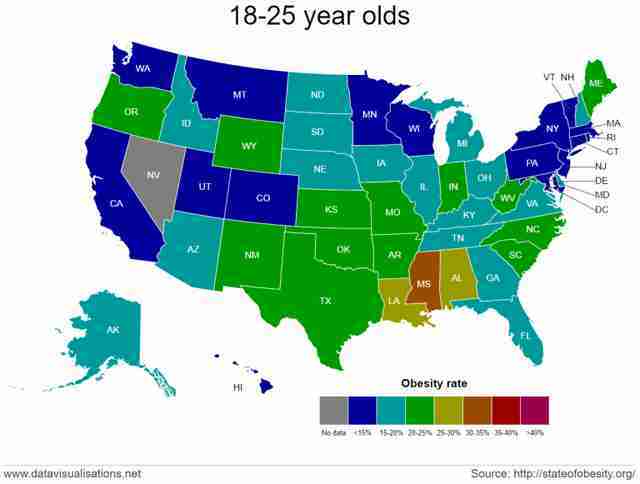 You’ll notice that when it comes to the sample’s youngest demographic, many states have a population of overweight teens and twenty-somethings, with 30-35% of 18-25-year-olds classified as obese in 21 states. As one would expect, the problem worsens with age. The 26- to 44-year-old group harbors a more severe level of unhealthiness, while the obesity epidemic crests at the 45- to 64-year-old range -- where it is quite severe. As the study’s description notes, this all follows a trend. 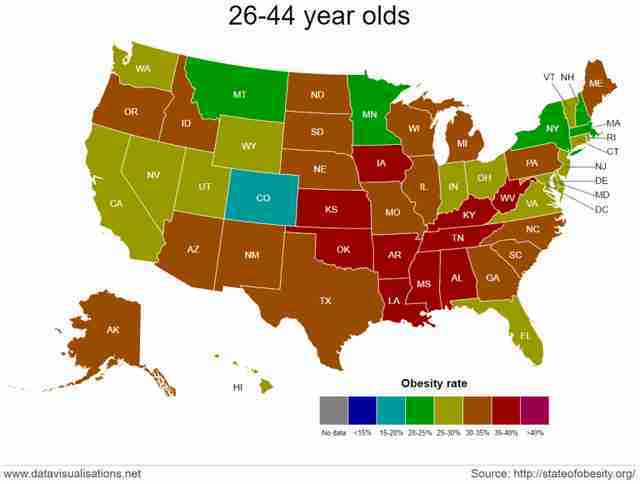 “The states with the highest overall obesity rates also have the highest obesity rates in each age group.” Among the most adversely affected states are both Dakotas, Texas, Tennessee, and several others. The final map, detailing the oldest demographic, is actually quite sparse, as only a handful of states fall into the 30-35% range. Unfortunately though, this is due to something grim: “In almost every state obesity rises with age before peaking in the 45-64 age range and then declining. The cause of this decline isn’t clear but one obvious possibility is simply that obese older people are likely to die earlier than their thinner counterparts,” the report finds.